This powerful Hoover F5914-900 SteamVac with Clean Surge saves you the expense and hassle of having to rent a steam cleaner and keeps rugs, upholstery, and bare floors (other than hardwoods) looking like new. 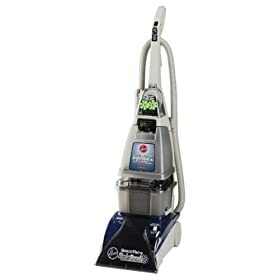 The powerful 12-amp motor combined with five spinning brushes that operate at either high or low speed lift the usual dirt and grime out of carpets. By pulling on the trigger in the comfortable upright handle, this deep cleaner releases the included carpet/upholstery cleaner and hot tap water. For more stubborn stains or for high-traffic areas, this SteamVac also has a Clean Surge feature, which sends an extra blast of cleaning solution into the stain by simply pressing a button on the handle.